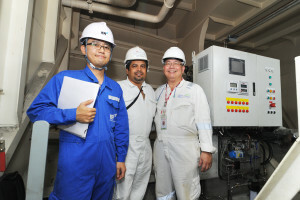 With consistent results, verified by independent classification societies on ships and engine manufacturer on test bed, Keppel Offshore & Marine’s subsidiary Blue Ocean Solutions (BOS) has proved that emulsified fuel can bring significant fuel savings adding to the well established NOx reduction, if done correctly. The patented BOS Emulsified Fuel System (EFS) improves combustion efficiency by improving the injector fuel atomization. In addition to the measured fuel savings, firm evidence of better combustion has also been recorded in the form of increased heat release rate. The key success factor in emulsified fuel is the ability to produce and maintain the optimum 10% water as water-in-fuel particle sizes of 2-8 microns. This is achieved with the patented BOS Emulsifier that unlike other systems in the market, has no moving, cavitating or vibrating parts. The system has been tested on both two-stroke and four-stroke engines. Diamond Shipping, one of the largest owner and operator of modern medium range product tankers in the world, was the most recent to place an order for BOS EFS to improve fuel efficiency. To date, references include American President Line (APL), Regent Seven Seas Cruises, Wärtsilä, Townsend Thorensen, London Overseas Freighters, B&I and others. Despite the numerous references, Blue Ocean Solutions has been cautious with public announcements until there have been adequate independent verifications by namely: classification societies (DNV GL and Lloyd’s Register); engine manufacturer (Wärtsilä); and ship owners. It is important that the 2-5% fuel savings, trouble free operation and improved maintenance has to be independently verified. Anything else is hearsay and unproven. Wärtsilä has also tested the system under the Project Hercules on medium speed engine Wärtsilä 6L20CR operating under Miller cycle with a two-stage turbocharger and running on MGO. The tests confirmed improved fuel efficiency with no need for chemical additives. Even though Blue Ocean Solutions introduced the BOS EFS to the market in late 2010 in response to the sudden steep hike in fuel oil prices, the R&D work goes back to the early 1980′s. Dr Jerry Ng KL, the founder and CEO of Blue Ocean Solutions was one of the members of the team that pioneered the application of emulsified fuel technology to motor ships at the University of Newcastle, UK (Reference: Patricia A. Strandell & Henry W. Schab, “A REVIEW OF WATER EMULSIFIED FUEL INVESTIGATIONS FOR SHIPBOARD APPLICATIONS”, Naval Engineers Journal, March 1986.) He was awarded a scholarship in 1981 and the National Young Scientist & Engineer Award in 1989 for his work in emulsified fuel technology. At the 25th Sea Trade Award in 2013, Blue Ocean Solutions was commended for its contribution to clean shipping using BOS EFS.